Claudia had the best clothes, obviously, all those earrings and matching high-tops. Also, the best hair. And eyes. I wished I had almond-shaped eyes. I once tried to hide food in my room like Claudia did, but the second I did I went back to each secret hiding place and ate it all. I hoped that maybe I forgot one spot and would find some food someday but I never did. I liked Mary Anne the best because I always like the underdog (although I could never figure out how to pronounce her last name, Spier). It was amazing when she and the hunky Logan Bruno actually got together, especially after she rebelled against her dad and undid her braids and her hair was all wavy and beautiful. It was not hot, however, when she and Logan dressed as cats for Halloween. That was weird. She also wore a mustard seed necklace under her costume even though it didn’t go with the outfit, but was somehow tied into the spooky ghost story part of #17, Mary Anne&apos;s Bad-Luck Mystery. Was Kristy gay? I never considered that (nor did I really knew what “gay” was at the time) but it would make sense now. I hope that wherever she is, adult Kristy is doing great. Stacey and Dawn were very similar: Both were blond, although Dawn had lighter hair and was a vegetarian from California (as all Californians are), whereas Stacey, the diabetic, had darker hair and was from New York (as all diabetics are). She was a total jerk when the other girls came to visit her and embarrassed her with their yokelism and She. Wanted. To. Die. Get over it, Stacey. You’re not that great. Remember when Mallory suggested giving one of the babies soy formula and the older girls thought she meant soy sauce? Dumbasses. In grade school, my friend Marissa tried putting together a baby-sitters club. I don’t remember it going anywhere further than one meeting, which I mostly recall thanks to her mom’s awesome chocolate-chip cookies being in attendance. One of my oldest friends, Nora, and I traded the books back and forth when we read them, which annoyed my mom, who I guess considered the books trash. But things came full circle when her younger sister Bridget played one of the Pike girls (siblings of Mallory, one of the johnny-come-lately sitters) in the Baby-sitters movie. I should talk to Nora and ask her how that made her feel at the time. We never really discussed it. I saw Nora this weekend, and Bridget as well. Despite her stint as a child star, she is a very normal human being who just passed the D.C. bar and ran the Turkey Trot 5K. So all things Baby-sitters do have happy endings, despite my mother&apos;s misgivings. 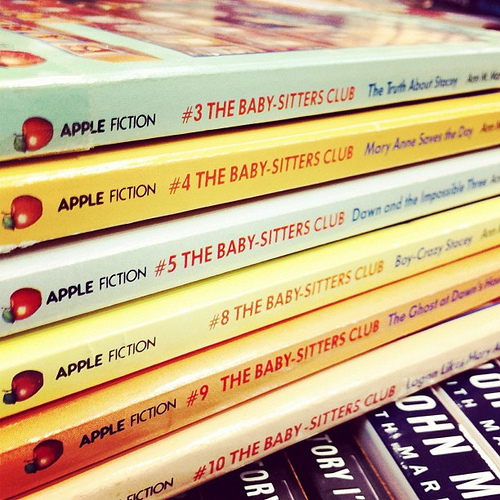 Were you also a Baby-sitters fan, and if so, what do you remember most from the books?